We’re proud that some of our technologies and discoveries have become a reality and are now on the market. It’s a pleasure to collaborate with companies to develop these products and bring them to society. Our market-driven approach combines with the know-how of companies to develop final prototypes, taken them through the pre-clinical and clinical requirements stages when required, and successful navigate the regulatory pathways to obtain commercial authorization to finally make things a reality. Below are some of the examples which are a reality today, but we are working on other, still confidential, products that we hope will reach the market and offer a solution for patients soon. Lighting in hospital operating theatres plays an important role in any surgical procedure. IBEC’s former Robotics group led by Prof. Casals, Parc Taulí and the companies Telstar and Luxiona have developed an innovative smart lighting system for operating theatres. It consists of an overhead light and two oblique light sources. Thanks to the way they are positioned, the lights eliminate shadows in the working area while also minimising infrared and ultraviolet radiation. Other advantages over traditional lamps are a reduction in the risk of hospital infections, higher energy efficiency, and a significant improvement in working conditions for medical staff. The system could have additional uses in spaces where light and airflow need to be controlled, including delivery rooms and other facilities, and even non-medical settings. Equipped with LED bulbs, the new system allows users to efficiently control the direction and intensity of the light beam projected onto the surgical field as required during an operation. The product is currently in the market. A collaboration between IBEC, the UB and industry partner Ficosa resulted in a new technology to combat dozing off when driving. 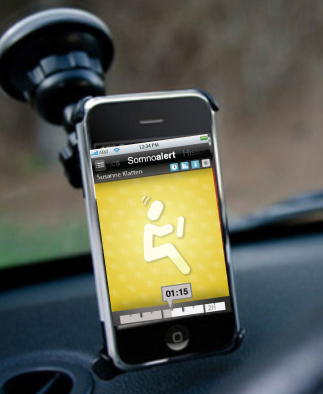 The drowsiness alerter, Somnoalert®, is a smart phone application that uses inertial sensors and GPS data to detect movements that are characteristic of nodding off at the wheel, such as deviation from the driving lane, or sudden corrections. A later prototype also incorporates biomedical sensors to analyze respiration data. The patented software is the result of a collaborative project between IBEC’s Signal and Information Processing for Sensing Systems group led by Santiago Marco, the UB’s Department of Electronic Engineering and Ficosa, a Barcelona-based multinational that researches, develops, produces and commercializes automobile systems and parts. “Accidents related with drowsiness have a very high social and economical impact, that the key automotive industry players are facing as a whole, in order to reduce current accident statistics,” adds Alan Montesi, who is responsible for the project at Ficosa. The technology was first presented at the GSMA World Mobile Congress in Barcelona, the industry’s biggest conference, in 2013. One of the most valuable routes to commercialize technologies and discoveries developed in research institutes is the creation of a spin-off company. This commercial route requires internal or external entrepreneurship and the capability to attract funding from such sources as venture capitals or business angels, depending on the economic volume required. At IBEC we promote entrepreneurship and are in contact with funding organizations. Here you will find information about some of our successful spin-offs. Rob Surgical Systems S.L. is developing the Bitrack System, a surgical robotic system for use in minimally invasive laparoscopy surgery. The Bitrack System is the result of a long track record of experience in robotic research done by Prof. Alicia Casals at IBEC together with researchers from Universitat Politècnica de Catalunya (UPC). The BITRACK robotic system provides better flexibility, modularity and efficiency compared to existing robotic systems, thanks to its innovative design that facilitates work in sterile and cramped environments such as operating rooms. It offers the advantages of minimally invasive surgery (minimizing the risk of infection and bleeding and shortening the recovery period) and surgical robotics (it provides control and mobility of surgical instruments and improves vision and access to difficult places). The prototype for the robot is already finished in terms of technology and will soon move into the clinical validation phase to gain approval for the European and US regulatory agencies and the markets. SurgiTrainer S.L. is a company founded by dedicated entrepreneurs in Prof. Alicia Casals’ Robotics group and a clinical counterpart from the research institute of Hospital de la Santa Creu i Sant Pau (IR-HSCSP), Dr. Ramon Rovira, dedicated to the development and production of training systems for endoscopic and laparoscopic surgery. It is a spin-off of IBEC, IR-HSCSP and the Universitat Politècnica de Catalunya (UPC). The platform has been evaluated by the European Society for Gynaecological Endoscopy and its training programme Gynaecological Endoscopic Surgical Education and Assessment (GESEA), and meets a recognized shortfall in the training and specialization of surgeons. The use of this kind of training reduces cost overruns in the health system and improves the quality of surgery. It reduces the risk to the patient, secures a faster recovery, and cuts the number of surgical re-interventions and the length of operations. The company is finalizing an industrial prototype in collaboration with the European Society for Gynaecological Endoscopy (ESGE), with sales due to start very soon.